A Seattle native, Greg found his way to the Seattle Art Museum after working as a Brick Mason and attaining his Mechanical Engineering degree. 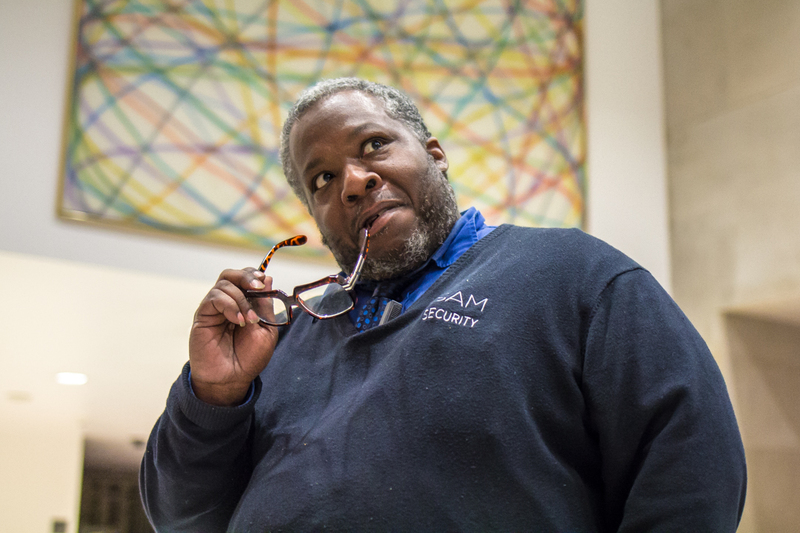 His love of art and personable nature make him a popular guard in the galleries. Tabaimo: Utsutsushi Utsushi opened on November 11 at the Asian Art Museum. Her works are mostly digital animation, with four pieces made specifically for this exhibition. Those pieces are based off SAM’s permanent collection pieces that are also displayed throughout the exhibition. Many artists take inspiration from the world around them, including Greg. In the galleries, he’s often drawing depictions of the works currently on display or making caricatures of other VSOs. SAM: What is your favorite piece of art currently on display at SAM? Thompson: The Italian Room on the fourth floor. The crazy thing about that room is that it was shipped from Italy piece by piece. I could take a nap in there. Kehinde Wiley and Gordon Parks. What advice can you offer to guests visiting SAM? Take your time and enjoy the experience. Tell us more about you! When you’re not at SAM, what do you spend your time doing? Well when I’m not at SAM, I like to do stuff in my studio like make mix tapes. I like to watch movies and spend time with friends and family. I’m also studying to be a ventriloquist—I can talk while drinking water now!